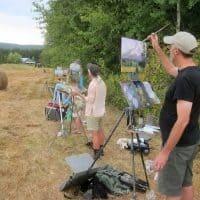 Drawing on a long tradition of painting in the open air, this event attracts some of the finest painters from the Pacific Northwest and from across the country to capture the stunning light and inspiring vistas of the Columbia River Gorge. After four days of painting, works are displayed at Maryhill with juror-awarded prizes given to the most exceptional works.Works will remain on view and available for purchase in the museum’s M.J. Murdock Charitable Trust Education Center through August 25, 2018. Artists spend four days painting at various locations throughout the Gorge, including on the grounds of Maryhill. Enjoy a day of figure painting en plein air on the grounds of Maryhill Museum of Art. 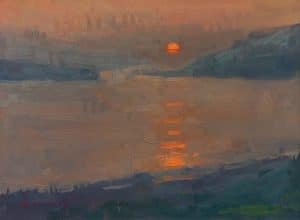 This full-day workshop is led by artist and teacher Randall Sexton, one of the premier contemporary California landscape painters working today. Known for his use of color and expressive brushwork in oil paintings of “everyday” scenes, Sexton has a reputation for being an educator as well as a fine artist. He taught drawing, painting, and composition at the San Francisco Academy of Art until 2005, and now leads private workshops around the country. Cost: $170; limited to 17 people. Student is expected to bring their own easel (plein air set-up) and supplies (confirmation and supply list will be emailed to you upon registration). The workshop fee includes model fees. To register, contact Maryhill Museum of Art at (509) 773-3733, ext. 27. August 4 | 5 to 7 p.m. The public is invited to view the “fresh” paintings artists created in plein air, meet the artists, and enjoy wine and hors d’oeuvres. Artwork will be available for purchase, with a percentage of the sales benefiting Maryhill. Awards will be given in a number of categories, including “Best Sky,” “Best Mountain,” “Best Water,” “Maryhill Museum of Art Award,” and a purchase award. Paintings remain on view and available for purchase through August 25. August 5 – 25, 2018 | 10 a.m. to 5 p.m.
Exhibition opens Saturday, August 4 during the artist reception from 5 to 7 p.m. Paintings are available for purchase in the Event Sales Gallery in the M.J. Murdock Charitable Trust Education Center. Proceeds support Maryhill Museum of Art. As work is sold and removed, other work created during the paint-out will replace it. Pacific Northwest Plein Air is made possible by the generosity of Dave Burbach Photography, Dog River Coffee, Framing Resource, Full Sail Brewing Co., Gamblin Artists Colors, The Griffin House on the Columbia River Gorge, Byron and Sue Henry, Stephen and Laura Muehleck, PleinAir Magazine, RayMar Art, and Scottsdale Artists’ School. Interested in becoming a sponsor? Please contact us at 509-773-3733 or email maryhill@maryhillmuseum.org for more information.